We're just a day removed from Halloween, but Daley Plaza is already filled with cabins that will soon house handmade ornaments, wooden clocks, sausages, strudel and more. Yes, the opening of Christkindlmarket is just two weeks away, which means you'll only need to wait 14 more days before you can eat potato pancakes and sip steaming Glühwein beneath the Picasso sculpture. Today, Christkindlmarket unveiled its latest lineup of souvenir mugs, which are included with the purchase of any hot beverage. While anyone holding out hope for the return of the market's boot-shaped ceramics will be disappointed, the new vessels sport a heart-shaped design, paying tribute to the theme of this year's market: “Ich liebe Christkindlmarket” (“I love Christkindlmarket”). 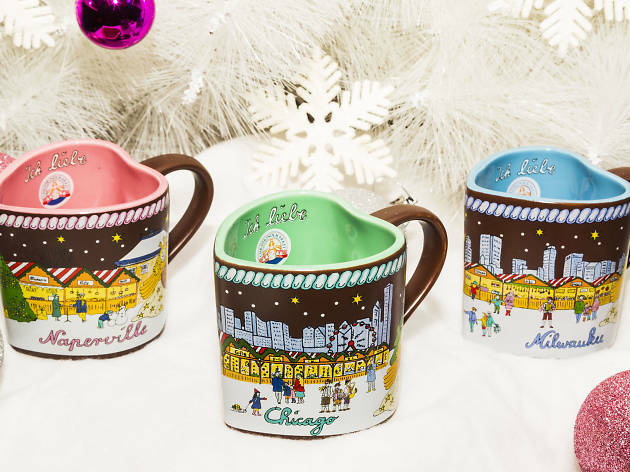 Christkindlmarket takes place in Chicago, Naperville and Milwaukee this year (the Wrigleyville edition of the market that was hosted at Gallagher Way is taking a year off), and each location will boast a unique mug. 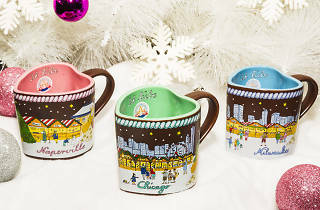 The Chicago and Milwaukee designs depict each city's skyline, while the Naperville mug includes the Millennium Carillon and a cabin at the Naper Settlement. A limited-edition set of all three mugs will be available at each Christkindlmarket location, but you'll need to act fast if you want to snag them. Take a look at the latest Glühwein delivery system below and don't forget to mark your calendar—Christkindlmarket Chicago opens for business on November 16 at 11am.